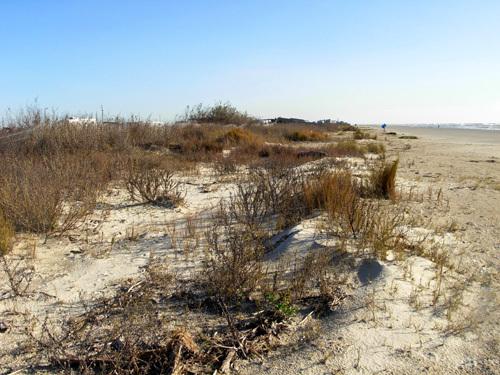 "Galveston Island State Park offers visitors a rare, intimate view of a barrier island ecosystem . . .
including beaches, prairies, and wetlands. Each supports a diverse array of life." 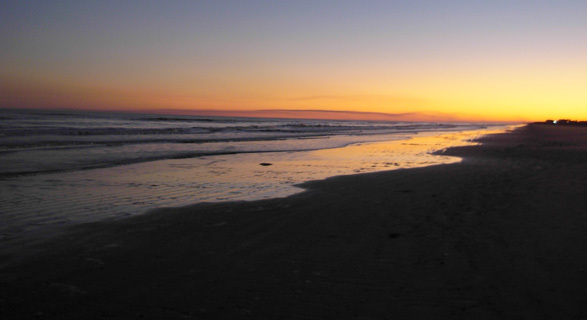 We now know why Galveston Island is one of the most popular state parks in Texas. It is beautiful and it is fascinating. The diversity of the various ecosystems is incredible. And it's warm in the winter!! Can't beat that! On the Gulf side you can watch the tide ebb and flow as you walk or run along the saltwater beach and you can camp right next to the sand dunes. 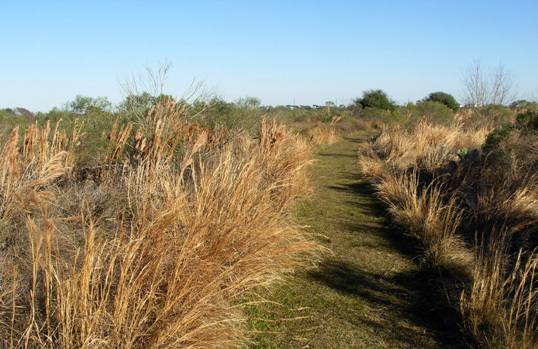 In the interior of the park you can run on soft prairie trails, cross freshwater lagoons on boardwalks, and watch the multitude of birds and mammals that inhabit the native grasslands. 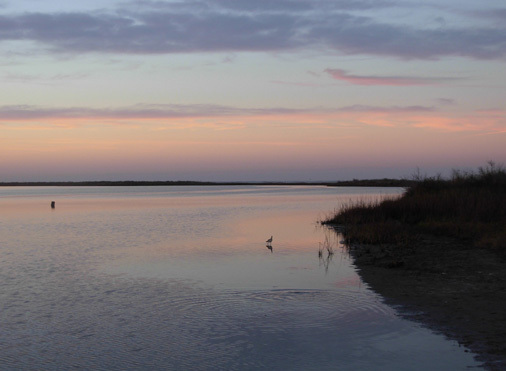 On the Bay side you can watch an even bigger show of wildlife that inhabits the shallow salt marsh wetlands between the island and the mainland of Texas. 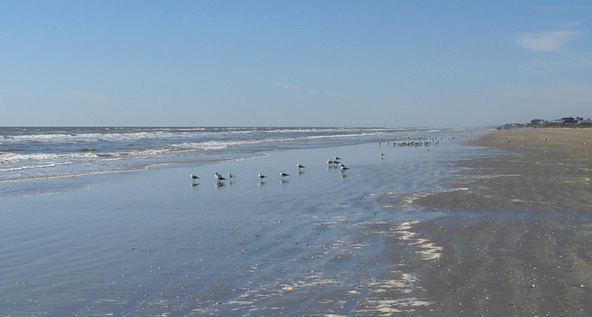 Galveston Island is thirty-two miles long and averages two-and-a-half miles wide. The city of Galveston dominates the eastern half of the island. The western half is more sparsely populated by humans, but hosts a wide variety of flora and fauna. 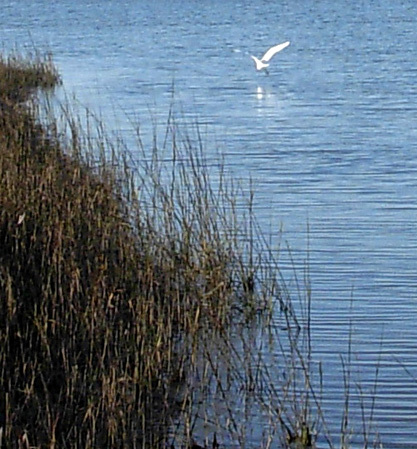 The 2,000-acre state park is on the western half of the island, stretching. more than a mile east-west along San Luis Pass Road and all the way north-south across the island from the Gulf to the Bay. If you are a nature-lover, you'll love this park. If you enjoy beaches, you'll love this park. There's even some interesting history for history-lovers! 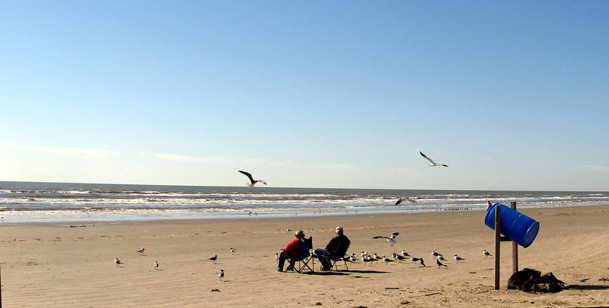 In the winter, Galveston Island is relatively warm. In the summer, the ocean breezes make it relatively cool. It's all a matter of perspective. I mentioned in the last entry that we were able to score a coveted dune-side campsite when we arrived yesterday. 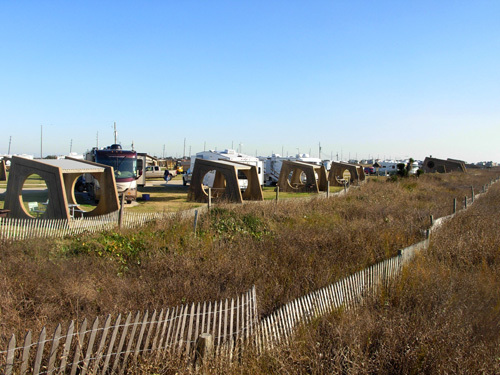 The park has about 180 overnight camping sites in four units. 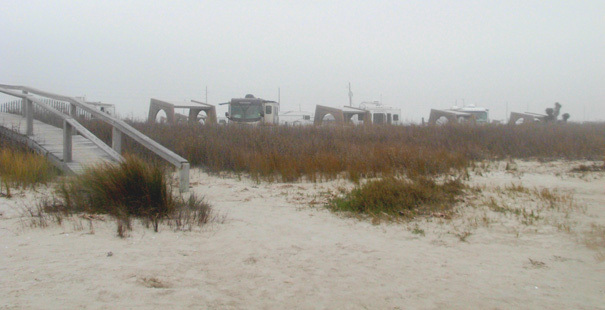 Three units are next to the beach on the Gulf; one unit is in the interior prairie region. There are also 60 day-use sites. The campground got increasingly more full each day of our stay from Tuesday to Saturday night. We often try to reach campgrounds where we plan to stay several days (or weeks) early in the week to have a better selection of sites, and that worked again for us here. It was so foggy yesterday that we couldn't fully appreciate the views of and from the campground . . . However, we are very glad we headed south yesterday and not northeast toward Tyler, Texas, the way we'd have gone home. About 55 people died overnight and today in 70 or 80 tornadoes that struck Arkansas, Tennessee, Alabama, Georgia, and Kentucky. There was hail, hard rain, and high wind in eastern Texas, including the Houston area just 40 miles north of Galveston Island. We had some 15-25 MPH winds last night on the island that rocked the camper, making us wonder just how good our decision was to come here -- but after hearing about those other places, we're glad we did! We woke up to chilly, clear, breezy, sunny weather this morning. It was one of those I-can-see-forever days -- and we took advantage of it. Although it was only 46� F. next to the beach when we got up, it was in the mid-60s by afternoon. It was a great day to run on the beach and explore the rest of the park across the highway. We have young (30-something) neighbors on one side of us with two leash-trained cats that the dogs find interesting, and a very quiet 40-ish couple on the other side -- it's not just retired sunbirds here in February. The sites are spacious and grassy. We have electricity and water hookups at our site, and a dump to use when we leave in four or five days. 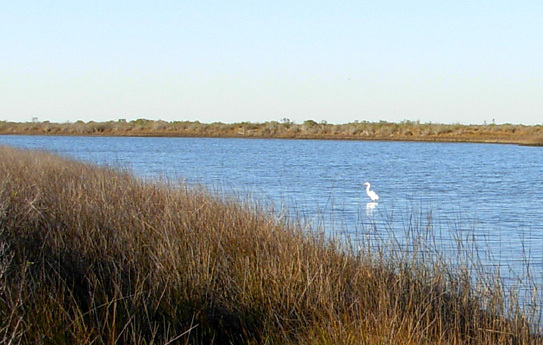 We're about seven miles from downtown Galveston, close enough to drive to town every day if we want but far enough away to be very quiet and peaceful. 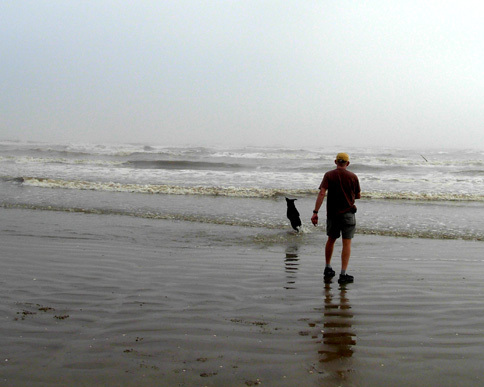 We really enjoy walking and running along the beach with the dogs at all times of the day, even when it is foggy. In fact, it is most primal to me when it is foggy or dark -- the pull of the tide, the lapping of the waves -- the visceral feeling is more intense for me then. Like the shifting dunes at White Sands National Monument in New Mexico, these dunes are also constantly moving and changing with the wind and water. So are the beaches. 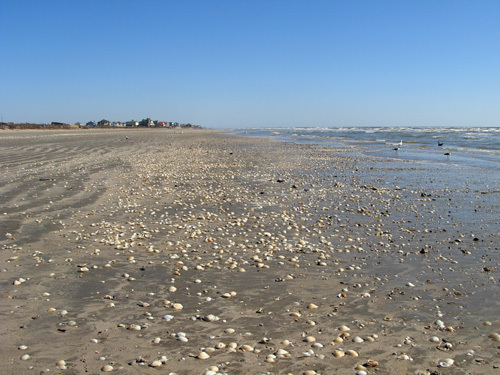 Barrier islands like Galveston serve as transition zones between land and ocean. It's very symbiotic. The beach helps the island shelter the mainland from the ravages of wind and water. 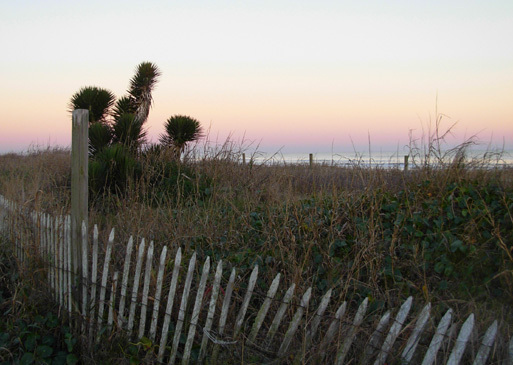 The dunes help protect the island itself. 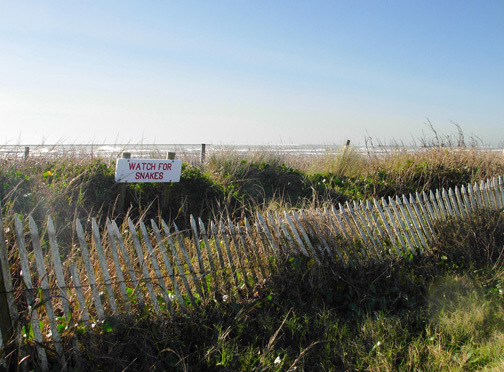 And the grasses, morning glory, primrose, and other plants help stabilize the dunes so they can do their job. This beach is wide whether it's at high or low tide. Even at high tide there is enough sculpted, hard-packed sand to run on (it's softer closer to the dunes). I was hoping I could try some barefoot running but there are a LOT of shells on this beach, especially close to the water's edge - ouch! 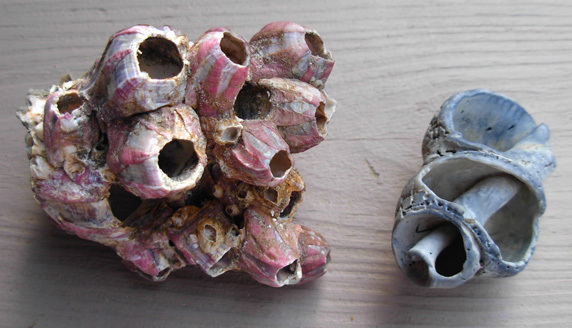 If anyone can identify these shells, please let me know. I've looked at several seashell ID web sites, but can't find either one. I'm curious what critters lived in them. There were many variations of the pink type on this beach. Most were smaller than this specimen, which is over 3" wide. NATIVES & PIRATES & SMUGGLERS, OH, MY! 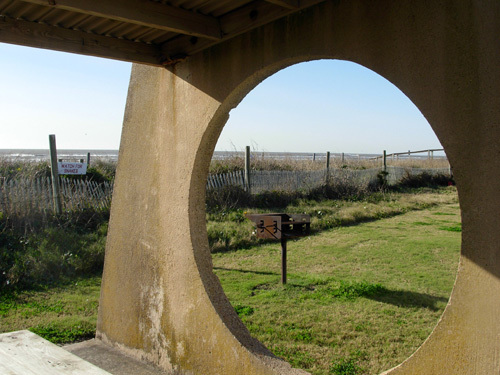 The beaches of Galveston Island have a long and sometimes-mercenary history. Nomadic Karankawa (Carancahua) Indians hunted and fished on the island for generations before Cabeza de Vaca and his group of Spanish explorers discovered it in 1528 when their boat shipwrecked on the beach at the eastern end of the park. The story of that whole harrowing expedition is worthy of further investigation, if you're interested (do an internet search on his name). De Vaca and only three other survivors of about 300 men who journeyed with him to America eventually made it back home after nine years sailing the seas, landing on Florida and then Galveston Island, and wandering around the Southwest. Later, pirates from various countries used the island as a refuge and base of operations from the early 1600s to the 1800s, men like Jean Lafitte (France), Captain Kidd (Scotland), Henry Morgan (Wales), and Blackbeard (England). You may have heard the legend about pirates tying lanterns to the back of burros and leading them along Galveston Beach, hoping passing ships would think they were other ships and wreck in the shallow water -- making them easy prey for the pirates to plunder. Very sneaky. 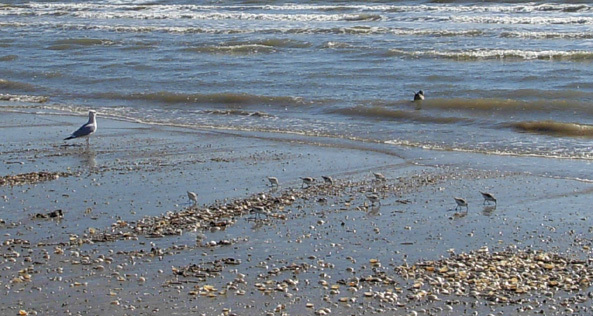 Smuggling was also common on the more isolated western end of Galveston Island. Slaves were illegally dropped off here in the 1800s, as was liquor from Cuba, Jamaica, and the Bahamas during Prohibition. The island has played a role in politics and wars, too. Jean Lafitte built outposts here during Mexico's revolutionary struggle with Spain in the early 1800s, the first government of the Republic of Texas found refuge here briefly, and German submarines cruised on the horizon during WWII. Lots of drama around here the last half millennium. Now sailboats, shrimp boats, and drilling rigs can be viewed in the Gulf waters from the park's shoreline. Dolphins and brown pelicans cavort among the waves. Vacationers bask in the sun and view the wildlife. Residents build McMansions as close to the water as they can. The beach continues to be a refuge and retreat for humans and animals. Busy place, this beach! 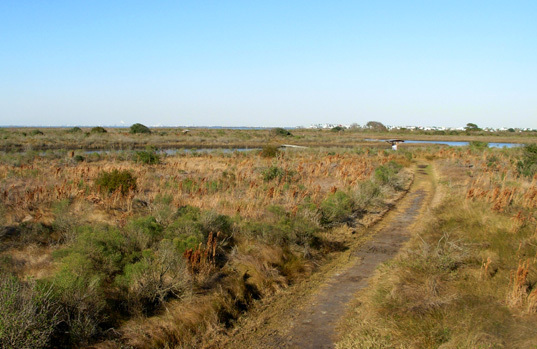 The upland tall grass and lower saltgrass native prairie extends from the dunes a couple of miles north to the salt marsh wetlands by the Bay. Prairie habitat used to dominate the entire island, but now the native grasses have largely disappeared because of grazing by buffalo and cattle, continual development, and losing the battle with invasive plants that have been introduced by humans. 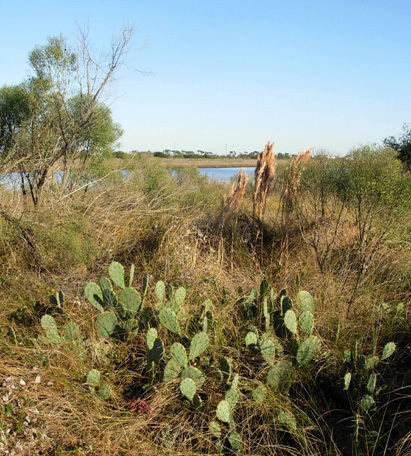 Native species like switchgrass and gulf cordgrass are being re-introduced gradually but successfully in the park by the Texas Parks and Wildlife Department. 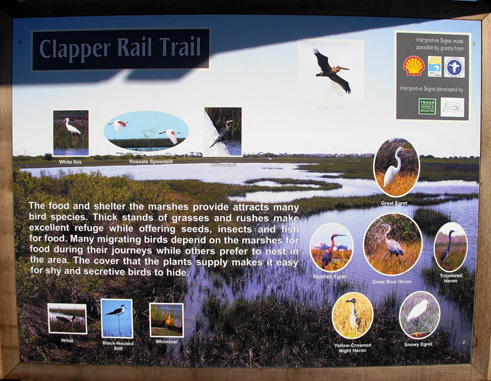 There are several large signs along the trail that describe the biodiversity of the prairie and wetlands in the park. 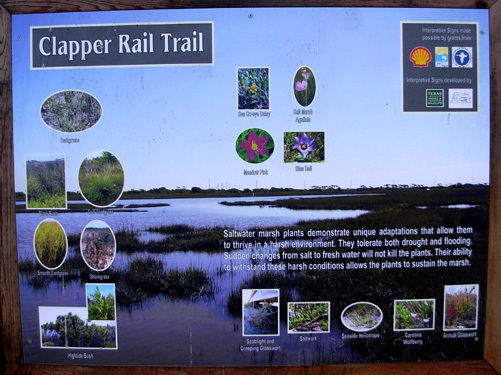 The one below shows several types of saltwater marsh grasses and wildflowers that are uniquely adapted to survive in this harsh environment. They can tolerate both drought and flooding, as well as sudden changes from fresh to salt water. 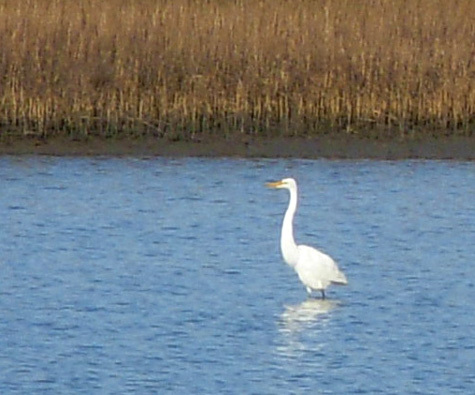 Despite the vicissitudes of the weather and the loss of habitat, many birds and mammals have adapted to life in the grassland and wetland areas of the park. Get this: over 60% of bird species of North America can be here at some time during the year! 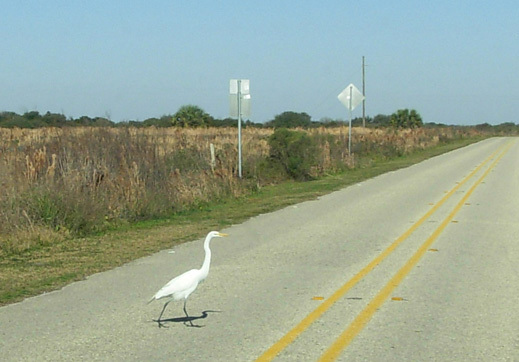 Some birds live here year-round, while others are migrating north or south. This environment is also home to raccoons, opossums, coyotes (we saw one! ), rabbits, field mice, toads, and snakes that that are able to tolerate the hazards of island life. Ducks, turtles, and frogs inhabit the ponds that usually contain fresh water from rainfall. 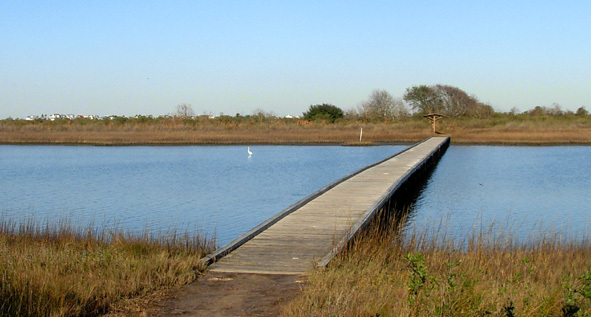 When the park floods from hurricanes, those ponds become brackish with saltwater but they eventually return to their freshwater state after enough rain falls to tip the balance again. I was surprised to see Prickly Pear Cactus (below) in such a humid environment. I'm guessing those are not native, but I might be wrong. 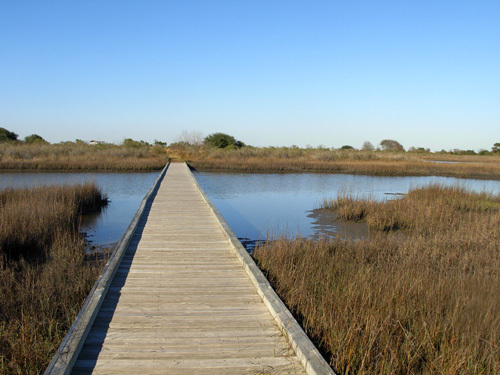 The trails follow the edges of several long, narrow bayous that stretch like fingers through the wetlands toward the Bay. Wildlife is prolific here, even in the winter. These vegetated marshes and bayous are found between the open bay and uplands (prairie) all along the western half of the island. 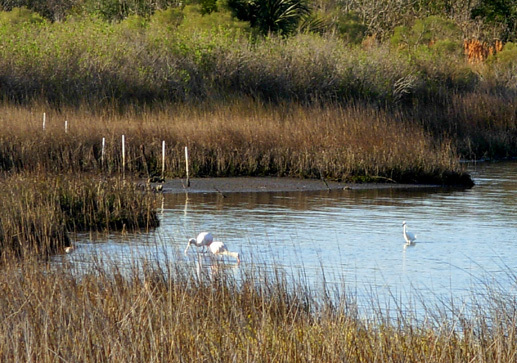 The coastal wetlands not only support the flora and fauna I've already mentioned, they also serve important environmental and economic purposes. They reduce the severity of floods and erosion to the mainland. They protect water quality for drinking by filtering out impurities, serve as a nursery for the large commercial and sport fishing industries, and support eco-tourism (i.e., watching wildlife, a rapidly growing "industry" of its own). The spoonbills are a lovely pale pink color. I'll share more softly-hued -- and some very dramatic -- sunset photos from Oak Bayou in the next entry, which will be mostly a photo essay.